One-third of the first home arrives at its lot. Tara Woods took delivery of the first new home for Phase III. 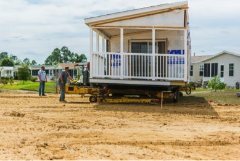 The first new triple-wide home was delivered on February 21, 2017. View more photos of the new home below.